Belgian striker Romelu Lukaku has admitted that he could look for a move away from Chelsea in the summer, as he has grown frustrated with his lack of first team opportunities. 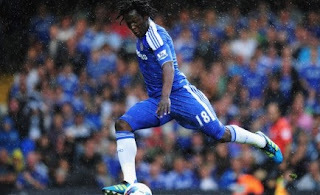 The former Anderlecht striker has only played seven times this year for the Blues. The 18 year old arrived at the Bridge with a lofty reputation that saw him rated as one of the best young strikers across Europe. But his failure to force his way into Andre Villas-Boas' first team plans has seen him grow increasingly frustrated and even look for a move away from the Blues. "If my situation at Chelsea does not evolve between now and the end of the season, it may be better to be loaned out for a season," Lukaku quipped. A loan this season is not possible, as I have already played for two different clubs. If this situation endures, it might be better to play for another club for a year and then come back."